The long national embarrassment and global apology tour of the previous administration has finally and thankfully come to an official end. When President Trump stepped to the podium, on Tuesday, to announce the United States would no longer be a party to the farce of a nuclear deal with Iran put together at the behest of Former President Barack Obama and rejected by the United States Congress, Trump declared for all to hear that America is back at full strength. Obama made the deal without the approval of Congress and in part gave the world’s number one state sponsor of terror $180 Billion dollars in cash and much of it delivered under the cover of darkness. How is that possible when Congress is in charge of spending? That is just another Constitutional violation that those inside the beltway routinely ignore. It is fully nauseating watching Democrats running around frantically trying to lecture the Trump administration on how to handle the Iran deal many of them, including New York Senator Chuck Schumer voted against the plan but suddenly are outraged that President Trump took the bold step to put America first and dump the disastrous deal. Before he decided that the Iran deal was a good one, which happened only because President Trump was ready to scrap it Senator Schumer wrote this on his official Senate website on August 6, 2015; It is because I believe Iran will not change, and under this agreement it will be able to achieve its dual goals of eliminating sanctions while ultimately retaining its nuclear and non-nuclear power. Better to keep U.S. sanctions in place, strengthen them, enforce secondary sanctions on other nations, and pursue the hard-trodden path of diplomacy once more, difficult as it may be. Our President, my President knows this was an untenable position and we simply could not allow it to continue. After all there were just 7 years left before Iran could return to its nuclear ambitions full speed. We cannot live in America with the threat of an Iranian nuclear missile headed to the U.S. mainland. This was a seminal moment in the Trump Presidency. 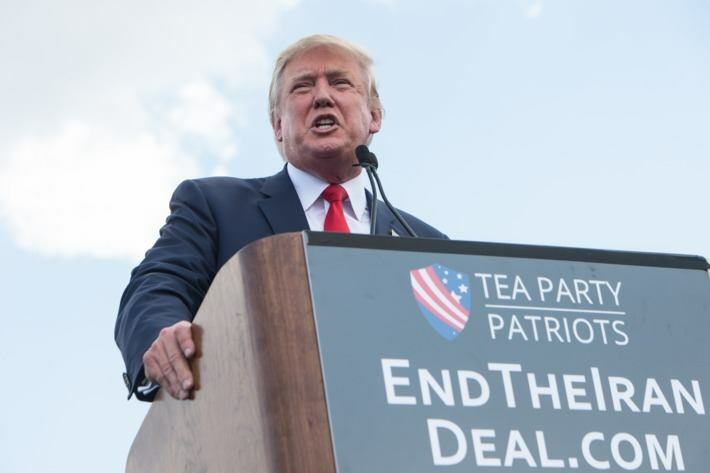 In fact it was the single most consequential speech Trump has delivered to date and he outlined a clear vision that will reintroduce severe sanctions against the rogue regime in Tehran. It only took a few hours before bombs rained on an Iranian missile battery that had been set up in Syria. It is believed the barrage came courtesy of the Israeli military and delivered with deadly precision. Israel also knows having Iranian missiles in proximity is not a tolerable risk. Trump said quite clearly for the world to hear, that “America will not be held hostage” by a radical regime with nuclear weapons. It further expands the Trump doctrine that has made it clear that nations like North Korea and Iran will be held accountable and The United States will not sit idly by while dark nuclear ambitions are pursued by those nations. The United States will not be cowed into silence no matter how loud the complaints from allies like France and the U.K. America comes first for Donald Trump and that is quite refreshing. But the left is desperate to take back the narrative as polls are heading up and the Democrats chances of a blue wave are receding into the background. Loud liberal critics continue to give Trump unsolicited advice on how to handle North Korea and Kim Jung-Un despite the glaring fact that nothing tried by Barack Obama or any President for that matter since Bill Clinton’s initial epic failure on the topic have produced any results. The left is stunned that the Trump Doctrine is working at home and on the world stage. The Trump Doctrine simply put is this; if you put the United States at risk we will turn and face the threat head on. We will as a nation defy the critics, no matter who they may be to make sure our safety and welfare are first in any decision. The Trump Doctrine is America First. It is what he promised after all. The message Kim Jung-Un should take away from Trump’s exit from the Iran deal is that he is not playing games. The President made it crystal clear that America means business and he will continue to fulfill the promises he made on the campaign trail. In case you have forgotten here are some of the things Donald Trump the candidate promised voters all along the campaign trail in 2015 and 2016: Paris Climate Deal out, Individual Obamacare mandate terminated, Trans Pacific Partnership gone, Obama’s war on coal over, appeasing America’s enemies history, putting conservatives on Federal Courts it’s happening, regulations flushed, taxes cut and the anti-American, anti-freedom, anti-Constitution, anti- Western Civilization years of Barack Obama being cleansed from our nation like a deep colonoscopy. I watched a competent, sober, resolute Commander in Chief step to the podium and deliver an important declaration in defense of American Citizens and the world in a way I haven’t seen in a very long time. I was proud of The President, my President in that moment because I agreed with what he said and more importantly why he was saying it. Yes, I agree with The Trump Doctrine of always putting America First. is begin incorporating nearby into your search phrases.